Over in Holland, Hans-Christian Rieck has taken these photos of a traditional steel-built Dutch dinghy of a type often used as tenders to steel-built barges and other craft. They’re strikingly curvaceous little boats, given that they’re made from plates of sheet steel, particularly when compared with the steel-built Forest & Stream skiff seen in the background. The F&S skiff is being smoothed with filler prior to being painted and having its woodwork fitted. I will be fascinated to hear how this boat works – and I trust it does work well in steel, as it will presumably have a theoretical life time of 80 years or more. I’m pretty sure it will be fine, by the way – it’s clearly greatly scaled up from the 12ft ply dink I drew some ten years ago no, and that will no doubt compensate for the extra weight of the hull. I’d like to take a trip to see it once she’s in the water if that’s ok please Hans-Christian! Hans-Christian’s workshop trains youngsters in the metalworking skills, and the steel dinghy belongs to the Graf Ship Association – it is destined to be cleaned and refinished. 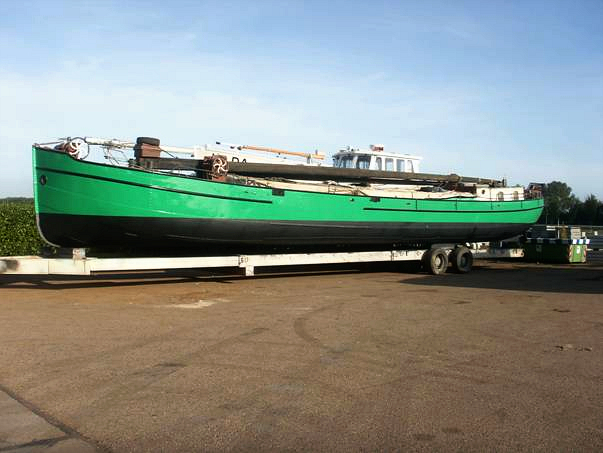 Here are some earlier images of the F&S skiff, and of a ship, the Jantje ready to be transported to Nordhorn after being sandblasted and sprayed. 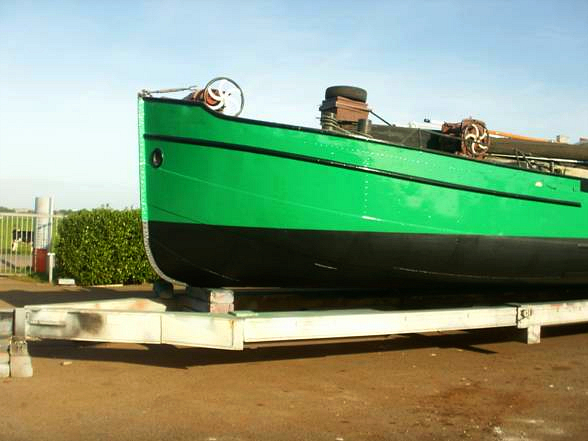 Shurely you can have a trip on the skiff soon as she´s finished. Probably on the first weekend of June, there will be the "Feast of the Canals" in Nordhorn. Then you can test the pram dinghy as well. Many thanks Hans-Christain – that would be great. I haven't been back to the Fatherland in many years, I'm very curious about both boats, and I'm sure Julie would enjoy the trip too. Let's talk nearer the time. I’m sorry – I haven’t a clue!